Published: Jan. 12, 2014 at 05:49 p.m. Updated: Jan. 12, 2014 at 10:02 p.m.
Wes Welker returned to the field Sunday against the San Diego Chargers for his first game since suffering a concussion in Week 14. The Broncos have made some adjustments since we last saw him. They are using Eric Decker as their primary punt returner, which has worked well. 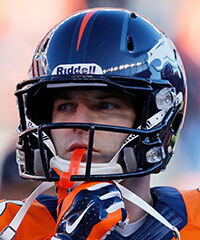 And Welker is using a new helmet that is hard not to notice. The helmet doesn't seem to be slowing Welker down; he made a nice grab for a touchdown in the second quarter. If Welker and the Broncos' offense keeps it up, we should get to see Welker take on his former team next week.